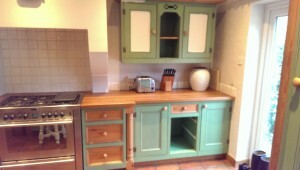 Kitchen Painters Woodford Cheshire: This hand painted kitchen in Woodford Cheshire had started to look its age. It was 16 years old so it needed a repaint and now it has a beautiful finish finish. 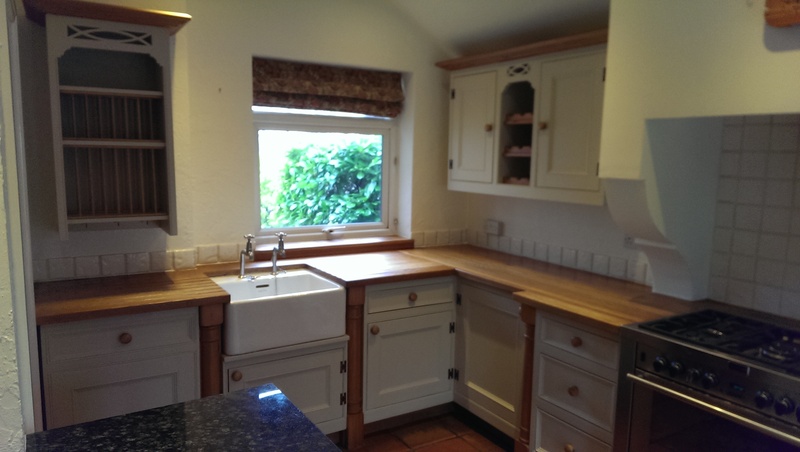 I went round after she had sent through photos of her kitchen to talk through options, colours and re oiling the wooden worktops as they looked dull. With the price agreed I was able to book a date in the diary when it would fit in with her schedule. Her kitchen over the years had worn very well. There were also cracks within a door. To alleviate this problem we cover both sides with lining paper after filling, this ensures the crack will never show or ruin the new paint finish. We started by thoroughly cleaning the kitchen using a tried and tested degreaser pro clean which just melts the grease away. We protect all the surfaces and floor with lining paper before a full sand using a dustless sander. As two of us work together, one does the doors while the other does the frames cutting our time in your home. We are now ready for priming – with knotty pine you have to use a shellac based primer. This is to combat any sap that the top coats of paint would draw out ruining the final finish. After two days of priming we were ready to apply the top coats which was Tikkurila Helmi, a waterborne hard wearing paint. The top coats go on pretty quick and dries in no time at all. Not like the oil paints a lot of painters use. 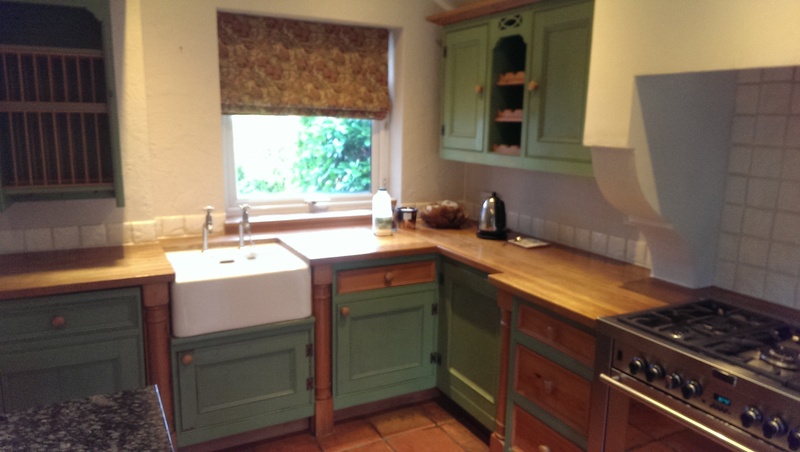 This kitchen was going to be a rather nice transformation. The decision was made that anything that was pine originally would be painted. A blending in with the rest of the kitchen. 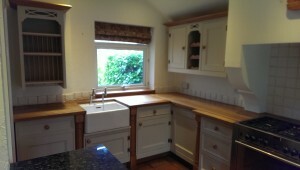 The worktops were cleaned with a product called Pro-Clean and allowed to dry. Once dry it was given a light sand to smooth out the surface before re-oiling. 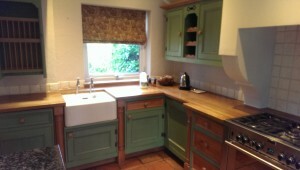 This will bring the worktops back to the original colour. 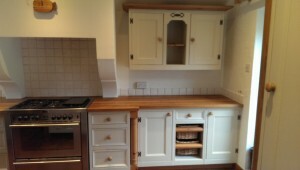 This goes to show with a quality kitchen it pays to have it painted professionally by a kitchen painting specialist. If your looking to have a kitchen or any furniture painted in Cheshire, Lancashire & Merseyside JS Decor are the first port of call.